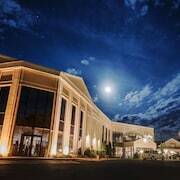 Where to find Pocono Mountains hotels near an airport? 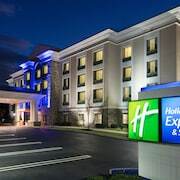 Where can I find hotels in Pocono Mountains that are near tourist attractions? You’ve probably seen paparazzi photos of Hollywood’s biggest celebrities checking into Poconos hotels. When you rub elbows with the travel rock stars at Expedia, you can have your own little adventure in the Poconos. The Pocono Mountains of Pennsylvania consist of five separate regions. Various regions are noted for fabulous shopping, amazing skiing, incredible hiking, family-friendly attractions, or historic treasures. Long before the area became a hot resort destination, it was inhabited by several tribes of Native Americans. The first hotel here was established in 1829. Residents of Philadelphia and New York City soon began flocking to the mountains for some fresh air and fun on the weekends. Following World War II, it became one of the most popular honeymoon destinations in America. Romance, relaxation, and raw nature can still be enjoyed at the many rustic resorts and hotels in Poconos. Are you ready to poke around for some Poconos hotel deals? 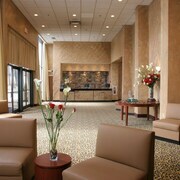 Follow us as we give you an insider’s view on saving money and having fun in the posh Poconos. Few destinations offer the same blend of sophistication and unspoiled nature as this majestic region of Pennsylvania. You’ll see elite travellers lugging around designer purses and designer golf clubs. You’ll also see ordinary families making the most of fun parks and nature trails. Of course, amazing dining options have sprung up to cater to the discriminating tastes of the region’s repeat clientele. All four seasons in the Poconos are filled with beauty. Spring is the time when flowers bloom along hillsides and river activities heat up. The local people throw exquisite wine festivals and culinary celebrations to ring in the busy season. The long, hot summers here are full of hiking, biking, swimming, tanning, and fireworks. Fall’s foliage glows brighter than summer’s fireworks. Mild temperatures offer visitors the perfect chance to drive around admiring foliage and shopping at boutiques. The region’s chilly, snowy winters make skiing in the Pocono Mountains a true treat. Whether you spend your days ripping through the snow or sipping hot chocolate by a fire, you’ll love every moment. The picture-perfect downtowns of Jim Thorpe, Milford, Stroudsburg, and Lake Wallenpaupack are filled with adorable shops, eateries, and galleries. In addition, historic mansions and museums are scattered throughout all the towns in the Poconos. 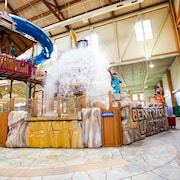 Notable attractions include the Mount Airy Casino, the Pocono Raceway, and the Camel Beach Mountain Waterpark. Most visitors choose to rent a car in the Poconos in order to explore various counties. When you plan your trip with Expedia, sticking to your budget while vacationing like a celebrity will be easy. 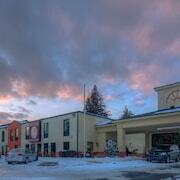 Discounts on fabulous Poconos hotels are waiting for you here on Expedia.ca. 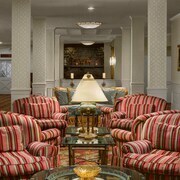 While you’re checking out cozy rooms, be sure to learn about our amazing rates on cheap flights to the Poconos. You may discover that booking one of our all-inclusive deals could turn your fancy getaway into an affordable vacation for the whole family. Our travel experts are standing by to help you learn how to stay at hotels near top attractions for the best price possible. Book your time in the mountains before your favourite celebrity scoops up the Poconos hotel room of your dreams. 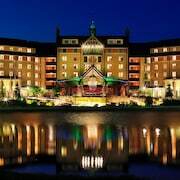 What are the most popular Pocono Mountains hotels? 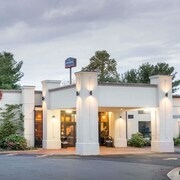 Are there hotels in other cities near Pocono Mountains? What other types of accommodations are available in Pocono Mountains? Explore Pocono Mountains with Expedia.ca’s Travel Guides to find the best flights, cars, holiday packages and more!